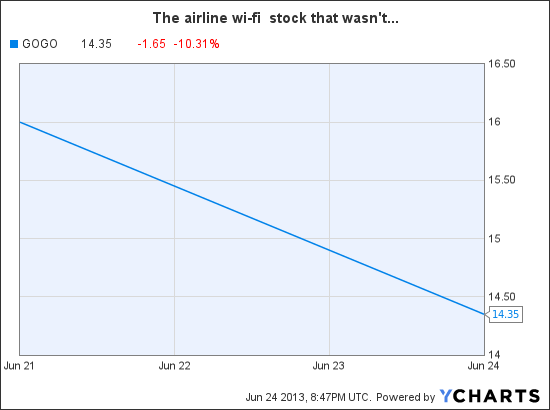 As Gogo’s stock falls 15%, will it be able sustain the business? Gogo is a high profile business with a small footprint for now, and if the new FAA regulations get relaxed, it will have a better chance. But its prices have to come down if it wants wider adoption…. The company raised $187 million selling shares at $17 each on Friday. The price has since fallen about 15 percent. The immediate problem for Gogo is that most travelers don’t pay for Wi-Fi access when they fly. Only about 6 percent of fliers…used the service in Q1. So it raised its prices, looking for profit from business travelers….The price increase did have the intended effect for Gogo, raising 2012 revenue to $233.5 million from $160.2 million in 2011. Still, the company has never had a profitable quarter; its average revenue per user was $9.74 last year…Gogo faces increasing capital expenditures as it expands to satellite-based service, starting with a 170-jet international fleet at Delta Air Lines.